Are you searching for a mellow spot to eat a hot meal over some soothing music and a glass of wine? Don’t pass up the Hilltop Restaurant. 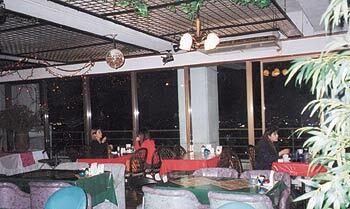 The restaurant has a spectacular night view and is open daily from 10:00 a.m. to 1:00 a.m. The Hilltop Restaurant has live bands performing every weekend. Catch Jonathan Capistrano and his three-piece group as they play a variety of upbeat and mellow oldies every first and third Friday and Saturday. On the second and fourth Friday and Saturday of every month the John Jones Band, which regularly performs at Pescadaria in Hamby Town, brings you the best of classic Elvis covers and other oldies. The restaurant also occasionally brings in guest Latin music bands. Over the past year, this restaurant has grown in reputation. Due to its popularity, management recommends that you make reservations if you are part of a party of two or more. Special events and reservations can be arranged at the cashier’s desk or by calling 098-930-2018. If you have a hearty appetite, you’ll want to try their special meal, which includes two main entrees served with soup, bread or rice, seasoned fresh vegetables, and dessert and coffee or tea, all for ¥2800. The meal is adequate for the heartiest appetite. For your two main entrees you can choose between Mexican style deep-fried chicken with tomato sauce, baked fresh island fish with eggplant, onion and green pepper, or filet mignon steak with mushrooms and mushroom sauce. The restaurant also offers several individual Japanese, Okinawan and Western lunch and dinner meals ranging in price from ¥1000 on up. I tried the filet mignon steak with mushrooms and mushroom sauce. This meal, priced at ¥1500, was fantastic! My plate was one of the dinner meals available on the menu, so it was accompanied by bread or rice, vegetables, French fries, and coffee or tea. If you are just dropping by for a quick snack or drink, the restaurant sells sandwiches for ¥350 to ¥550, a variety of coffees, teas, floats, fresh fruit juices, beers and soft drinks for ¥400 to ¥500. Cake sets cost ¥650 and include a piece of cake and a cup of coffee or tea. You can also buy cake by the slice for ¥350. Driving to the restaurant is easy. If you are heading north on Highway 330 away from Camp Foster, turn right at the Awase Golf Course intersection. Drive straight down this road until you reach a stoplight beside Awase Grocery. At this light, the road will naturally curve left, or if you go straight the road becomes smaller. Go left. Stay on this road going straight, and very soon you will see Hilltop Restaurant on your right. Plenty of parking is available. Enjoy!